Geelong looks set to tackle Brownlow Medal favourite Tom Mitchell head-to-head rather than applying a Scott Selwood clamp on Saturday. Coach Chris Scott has refused to apply a proper shutdown role on Mitchell in his three games as a Hawk against the Cats, with the gun midfielder averaging more than 38 disposals. Despite Selwood's availability – for the first time against Mitchell in Hawks' colours – the Cats are expected to back in their own midfield system at the MCG. With Mitchell collecting 40+ disposals in four consecutive games, Scott insists he won’t be let off the chain, even if it doesn't involve a hard tag. "(We) try to limit his impact in the first place," Scott said on Thursday. "I think there is a bit of a school of thought out there that clubs just don't care about it and they don't put any work at all into limiting his influence. "I don’t agree with that, but I think that's the perception a little bit. "We don’t think we need to unbalance things too much to try and limit his damage, but again, there's trying and succeeding." 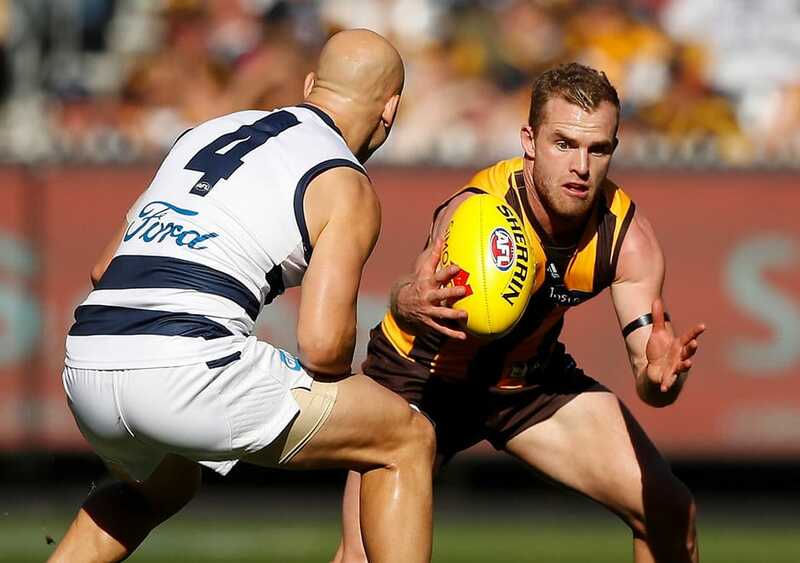 As Mitchell racked up 40 touches in Hawthorn's round two win over Geelong – one of 11 games above 40 disposals this season – the Cats rotated a number of players through him. Second-gamer Tim Kelly, Patrick Dangerfield and Gary Ablett spent time opposed to Mitchell, who collected nine of his side's 22 centre clearances. Champion Data statistics show Selwood has been used in various roles in his nine matches this season, moving away from his tagging jobs of 2017. "He's always got a role for us, sometimes it might be a little bit hard to work out exactly what that is," Scott said. "It hasn't been the traditional, 'go and stand next to an opposition player and stop him getting the ball 100 per cent of the time' (in recent weeks). "Yes, he is an option (to play on Mitchell) … (but) we've got to be really careful that we don't to bend the knee to Hawthorn. "Mitchell's a really good player, so is O'Meara, Burgoyne's in there a bit, Smith, but I assume in the corresponding (Alastair Clarkson) press conference they'll be talking about Dangerfield, Selwood, Duncan. "And Tim Kelly might be playing better than all of them." Mitchell's two quietest games in 2018 have come when copping a heavy run-with opponent, both in Hawthorn losses. Sydney stopper George Hewett followed Mitchell for most of the night in round eight as he finished with 17 disposals, while Ben Jacobs' blanket kept him to 19 touches in round five. However, Scott will well be aware of the outcomes of matches when too much focus is placed on Mitchell and other Hawks get off the leash. In round 16, as the Hawks kicked 12 of the final 14 majors against the Western Bulldogs, Josh Dunkley was sent to Mitchell (27 disposals). On the same night, teammates picked up the slack, Isaac Smith (30 disposals, two goals) and Jaeger O'Meara (28 disposals) doing the damage. Likewise, back in round four, Demons' co-captain Nathan Jones holding Mitchell to 24 touches as Liam Shiels (31 disposals) and Jaeger O'Meara (26 disposals) propelled the Hawks to 11 goals to one after half-time. Selwood will be on standby on Saturday afternoon should Mitchell start to impact the scoreboard, however, expect the Cats to try and make him chase their own star midfielders first.